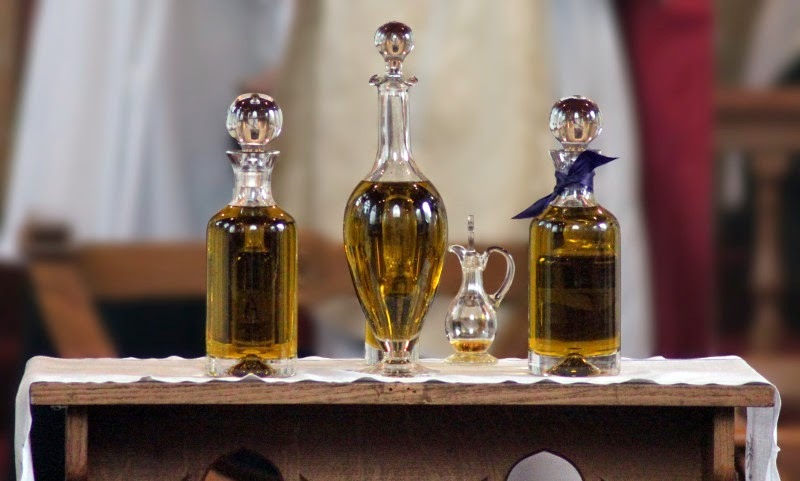 Rethinking Faith and Church: Healing Oil? Have you ever wondered about the New Testament's use of oil as a part of healing? Is "anointing with oil" still for us today? Like many things in christendom, the answer would probably depend on who you talk to. One dear brother of mine strongly believes and regularly practices anointing with oil as a part of his praying for others. Still, not everyone does. Today I would like to welcome back to Rethinking Faith and Church my brother Waldo Rochow as a guest blogger as he shares his heart in praying for the sick, and ponders the use of oil in it. I am joining you in regularly praying for your friend, Bro. Thanks for sharing. Let me begin with a few background details. I have a dear friend and sister in Christ who has been battling cancer for some time. When the cancer spread to her brain she had to undergo radiation therapy to zap the cancer cells before they spread further. This radiation therapy had the expected effect of causing her hair to fall out. She was distraught and shared her grief on Facebook. I was moved to my knees and asked God what I could do. He said to join her. So, I shaved my head. Since then, I have had the unexpected benefit of a greatly enhanced walk with Christ. I have found myself praying constantly. Every time I touch my head (which, I have come to realize, I do a lot) or see my bald reflection, I pray for my friend and for all those who battle cancer. This new way of living has been a real blessing for me. I have my own challenges: health, finances, relationships; but they are no longer all consuming. Anointed with oil many that were sick. The word is aleiphō. The papyri give us examples of its usage. We have a letter from the second century in which a man whose wife had gone away a month before, writes that he has not bathed or anointed himself. There is a third-century inscription in honor of a gymnasiarch (head of gymnasium) which speaks of him as the beloved anointer. In James 5:14, directions are given for the elders to anoint the sick person with oil. In Luke 10:34, the Samaritan treated the wounds of the man with oil and wine. Olive oil was a common remedial agent of the ancients and was used internally and externally. At a time when the healing art was at its infancy, and medicines were few, olive oil was a panacea for many ills. Here, the disciples are directed to use it in the healing of the sick. In the case of James 5:14, it is prayer and medicine, God working directly, and through the medicine, which resulted in the healing of the sick person. In this instance in Mark it is the same, but with this difference, that up to the time of the close of revelation with the writing of The Book of the Revelation, God performed miracles of healing through the apostles. This was for the purpose of attesting their messages as from Him. Since then, there is no need of this. Hence, God heals directly in answer to prayer now, not through individuals. The normal procedure now is prayer, the doctor, and the use of medicine and other means as God may direct. Where the two latter are not obtainable, God does heal without means when it is in His wisdom to do so. So the oil was medicine, it does not possess a mystical quality. Now I’m no physician, but it makes sense if you think about it. If you are fighting an infection, you might not have enough strength to eat, but a bit of oil would be easy enough to swallow, and the fat it contains would provide you with some much needed energy for your body to continue to fight that which ails you. If one has an open wound, I would expect that a layer of oil might help to keep bacteria from settling on it. To those living in the generations leading up to that time, the effects may have seemed quite remarkable. When I (Randy) was living in a remote part of Indonesia, I was often awakened in the middle of the night by grave news: “Quick, come to the dormitory, so-and-so is dying.” That will wake you up in a hurry. The first few times it happened, I nearly killed myself dressing and running full speed through the dark to rescue a student from the precipice of death… only to discover that he or she had a cold. The old “take two pills and call me in the morning” approach literally was the best treatment. Hundreds of students were sped toward recovery by the thousands of ibuprofen tablets I distributed. A few years later, I discovered that students considered me a man of little faith. All I did was give them medicine! They would always pray for the student after I had left. He goes on to discuss how in the modern western world, headaches and colds are understood and we tend to rely only on the medicine… it’s as if God is no longer needed. So what do we do with the healing oil? What I hear God saying to me is take your medicine, by all means. Just remember that Jesus is the real physician, the human counterparts are merely His assistants. When we pray for healing, we must have the faith of the woman in Mark 5:25. She touched Jesus’ clothes even though she knew that, as someone who was unclean, this was forbidden. Regardless of the consequences, she believed that only He could heal her. Perhaps, because we have fallen out of the practice of praying for healing of the “little things”, we don’t really see God’s hand in healing. Not seeing Him as the healer of the little things makes it much harder to believe that He is the healer of the “big things” too. Next time you reach for that bottle in your medicine cabinet to heal that headache, tooth ache, back ache or whatever; remember to both pray that God will use it to heal you, and thank Him when it does. You never know when you will need Him to heal something big, and as we see in Mark 6:5-6, it is only through faith that healing can take place.